← LBJ at Sid? and I’m going on vacation! Alice Dean was a member of the Institute’s first graduating class in 1916, but she didn’t have a lot in common with most of her classmates. She came to Rice in 1913, having been superintendent of high schools in Victoria but lacking a college degree. She graduated with honors in mathematics and stayed to work on a masters degree. She taught Math 100 for many years, although she had no formal academic appointment. By 1914 Miss Dean was already Rice’s acting librarian and began working closely with math professor Griffith Evans to build the institute’s collection. Not too long ago I ran across the first lists of books they felt they needed as they began to place orders with dealers in New York. I’ll post a couple of these when I get back from my vacation in glamorous Nebraska. 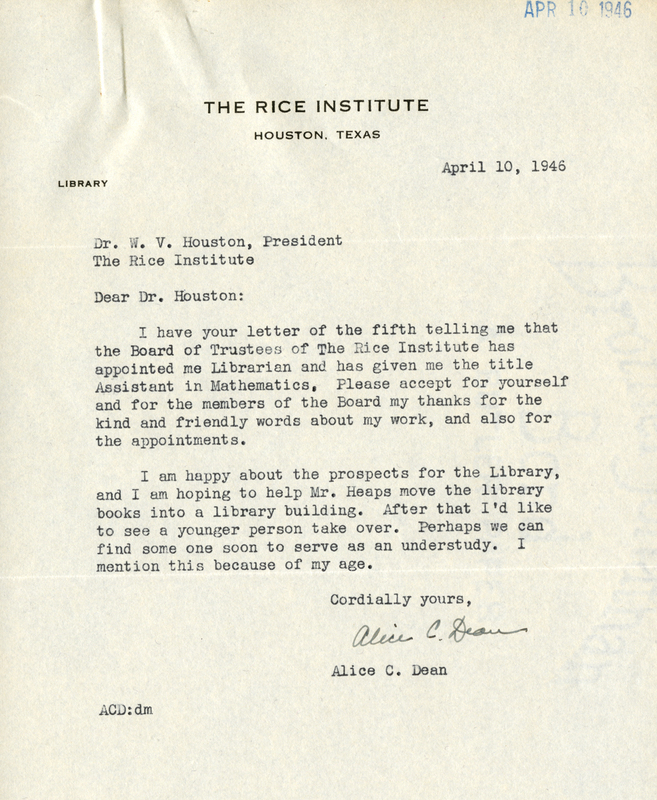 Alice Dean served Rice with great dedication for a very long time, and didn’t get much recognition for it. She remained Acting Librarian until 1946, when she was finally given the title of Librarian and a formal appointment as Assistant in Mathematics just as she was getting ready to retire. Not long ago I found her letter to President Houston after she was informed of these title changes. It strikes me as a model of absolute graciousness and restraint. Miss Dean worked very hard, but even she took time off to wade in the surf once in a while. 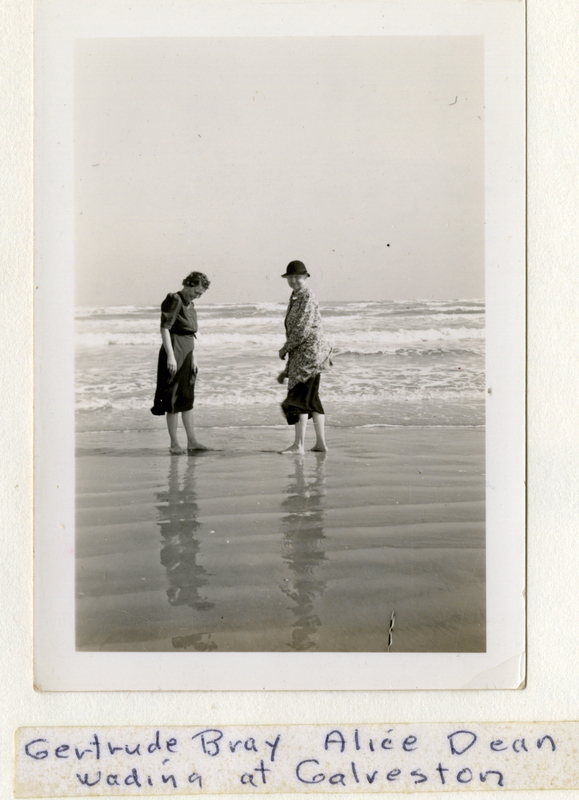 This picture was taken at the Math Department picnic in Galveston in 1936. Thanks for posting about Alice Dean! Her portrait hangs outside my office and it’s nice to know a little about her! She was truly a remarkable person. I have the greatest admiration for her. And thanks so much for commenting–if you have any photos of her that you’d be willing to let me scan, please let me know. Again, thanks. I appreciate hearing from you. There is some prospect of a return for part of the CWS. (At least if the airport doesn’t flood.) I’ve been going since 1990! Regarding the letter, it is always nice to be able to attribute in part, one’s higher and nobler personality traits to specific people or side(s) of one’s family. Thanks for sharing and I hope my father will be able to provide the painting or a copy thereof to you and also to Rice.